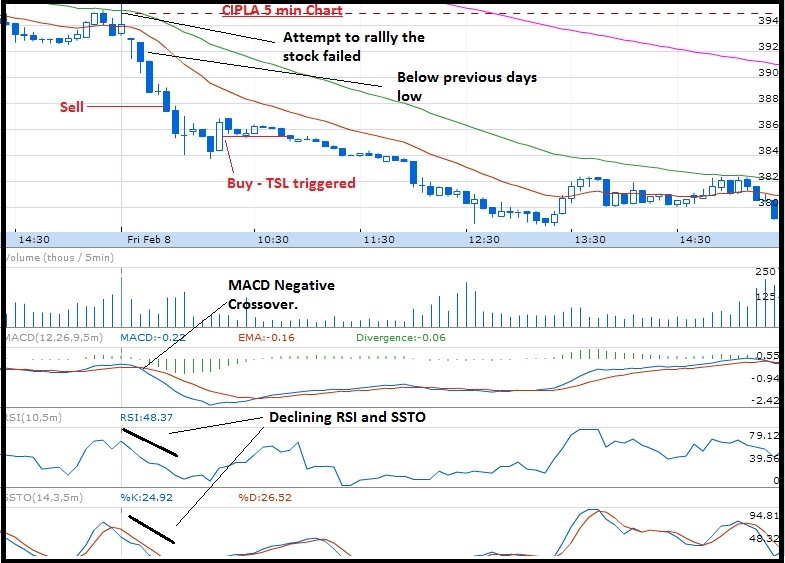 Cipla was faced with a brokerage downgrade the previous day. As soon as the stock opened on 08 Feb, it went below the previous close which indicates a clearly bearish sign. Please read here the significance of previous day's low. 30 day and 5 min charts were extremely negative giving clear indications. I entered within 10 minutes of market opening based on this, otherwise such an early entry is not advisable. Please see the charts below. L&T was consolidating nicely and I had posted an alert here on my blog during market hours. Consolidation is a very powerful and predictive pattern as I have posted multiple times in my blog. My alert was to buy above days high and above 1510. What was the significance of 1510. Simple!! Previous days high. Excellent example of consolidation and importance of previous day's low. I was watching this stock as per my pre-market analysis here. This stock again showed a very good consolidation for a very long time. Longer the consolidation, stronger the move will be after consolidation. Overall the stock was negative in daily charts and hence I was anticipating a down move. 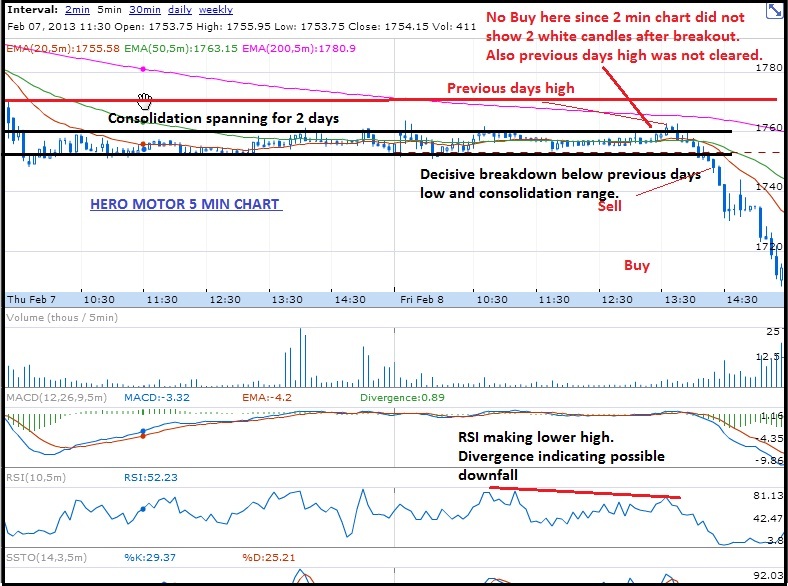 The consolidation in fact started from the previous day - see the 2 day chart below. A trade was only possible above the previous day's high or below the previous day's low. Hence during the consolidation, I alerted my readers to sell below 1748 here, which was previous days low. See what happened subsequently in the charts. 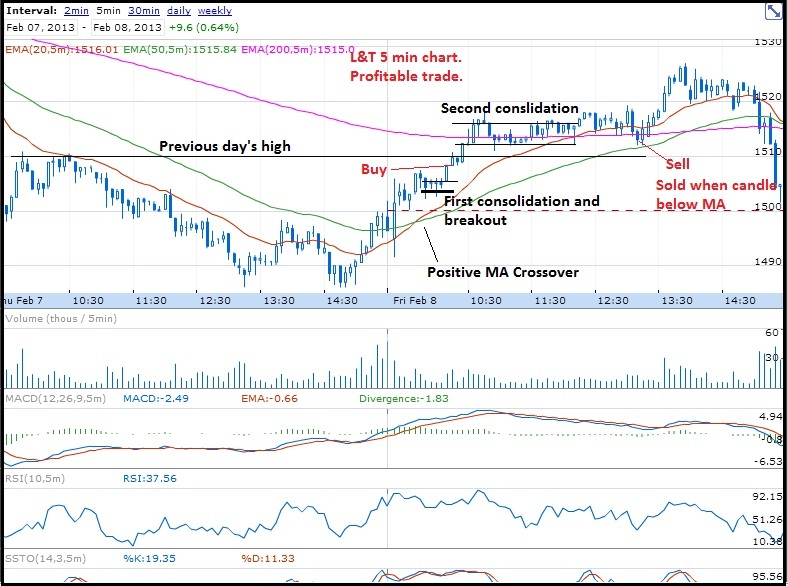 The stock attempted to move up after consolidation which was a false breakout. Since the previous day's high was not crossed, it was not a buy. Second reason was, there was no volume for that upmove. Rest of the details in the chart.